Michelle Schroeder-Gardner didn’t intend for her blog to become the income machine it is today. She started it more as a hobby, not even thinking she would ever make money from it. Once she made her first $100 from her blog, though, that changed. She saw the potential and got more interested in turning her hobby into a business. Her blog kept doing better and better, and eventually she was able to quit her job as a financial analyst and work on her blog full-time. She’s currently traveling full-time, touring North America in an RV and loving her life with her husband. Her blogging income picked up some serious steam in 2016, when she further diversified her income. Her main source of income up to that point was affiliate marketing, with some money coming in through sponsorships and advertisements. In 2016, though, she created her course Making Sense of Affiliate Marketing. Her income doubled the month she launched her course, and in 2017 she had her first million-dollar year. 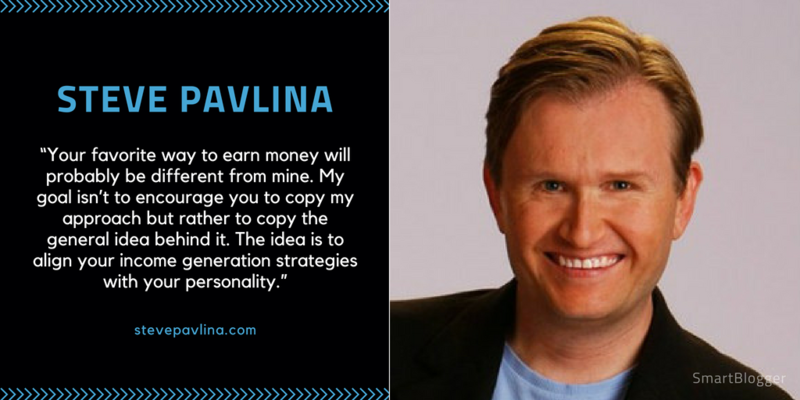 Steve Pavlina is an author, a motivational speaker, and one of the most prolific self-development bloggers online. He grew his blog to more than two million monthly visitors without spending a dime on marketing or promotion. Steve’s passion for personal development began when he was sitting in jail, having been arrested for felony grand theft. At that moment, he decided to work on improving himself and turn his life around. And it paid off. He accomplished many amazing things. He earned two college degrees in the span of three semesters. He founded a software company that developed computer games. He ran the Los Angeles Marathon and trained in martial arts. Steve has experimented with many income streams to see which he likes best. When hosting one of his workshops, he asks people who register about their personal struggles and uses this feedback to custom-tailor each workshop, which means he never does the same workshop twice. Steve has also written a book called Personal Development for Smart People, the purpose of which was to create a single framework for growth that people could apply to all areas of their lives. Pat Flynn was thriving in his career as an architect and had no plans to leave — until an economic downturn hit his industry hard and he was laid off from his job. Before all this happened, Pat had created a little website to help him study for an architectural exam. It got thousands of visitors, and he realized he could leverage this traffic for income. After studying up on doing business online, he created an ebook which he sold for $19.99 and made over $7,000 in his first month. This got him so excited that he started Smart Passive Income, a blog on which he would share his strategies that helped him grow his online business. Today, this blog generates over $100K each month, with some months doubling or even tripling that figure. But it’s not the money or material wealth that motivates him. Pat has remained a down-to-earth guy whose primary motivation is his family. He loves the freedom to plan his day around his family instead of his business, which allows him to spend the day with them and save work for after his kids go to sleep. Pat has done a great job of diversifying his income over the years. Chiara Ferragni’s track record is impressive, to say the least. She got her feet off the ground posting her daily outfits to Flickr, an image-sharing website, where she amassed a significant following. She then started her personal style blog in 2009 — when personal style blogs weren’t really a thing yet — and within two months she got tens of thousands of visitors per day. She quickly began receiving sponsorship offers from fashion brands such as Dior and Louis Vuitton. And three exams away from finishing her law degree, she decided to make The Blonde Salad her main focus. Since then, Chiara has amassed over ten million followers on Instagram, Forbes named her one of the most influential people under 30, and she was the first fashion blogger to score a cover on Vogue. And Chiara Ferragni has become a brand in her own right and makes thousands of dollars through sponsorships, modeling, and appearance fees. On top of that, Chiara leveraged her platform to launch her own shoe line, the Chiara Ferragni Collection, aside from her blog. This line has reportedly made made eight figures in 2016. 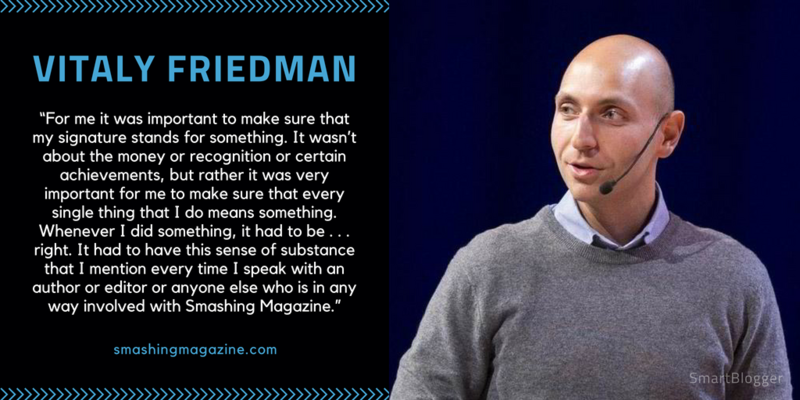 Vitaly Friedman was a freelance web designer before he started blogging. He had never taken a single design class at the time, but learned his skills from reading articles online. He always had an interest in writing and editing as well, though, and he wanted to give back to the design community, so he started blogging. Through one of his projects he was introduced to Sven Lennartz, who asked him to write for his German magazine Dr. Web. One year later, they started Smashing Magazine. They had no idea it would become one of the most influential resources for web designers and developers. It grew from two people’s hobby to a business with a dozen employees and hundreds of contributors, and today gets over three million page views per month. They now have a library of 60+ e-books for sale (which they also sell in packages). They run high-ticket conferences and workshops. They added a job board where companies can purchase job postings and find skilled employees. And they offer membership packages which are reportedly their biggest source of income today. 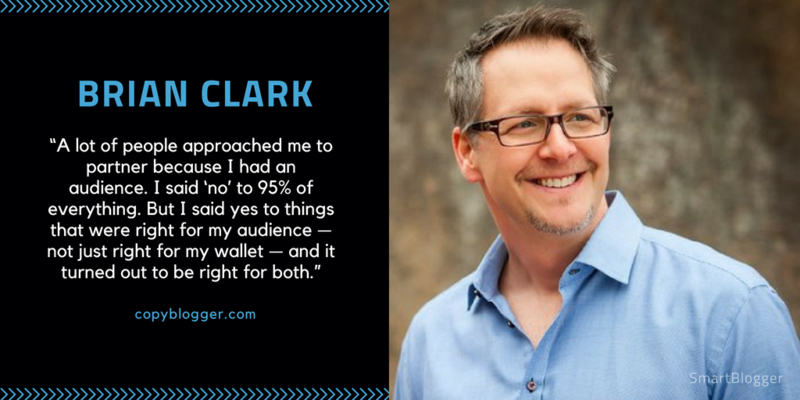 Brian Clark started writing about content marketing before people started calling it content marketing. He had been using content to market products and services for several years when he started CopyBlogger in 2006. At the time, he wasn’t focused on selling because he didn’t know what he would sell. He focused on building an audience and had faith that he would identify their pain points. And his faith was justified. As his audience grew, Brian was able to identify the problems content creators were having online, and he partnered with other entrepreneurs to create and sell solutions. Rainmaker Digital — a hybrid service and technology agency that builds sophisticated websites for its clients and offers services to create and implement successful digital marketing strategies. StudioPress — a marketplace that sells premium WordPress themes and hosting. Authority — a membership-based training program and community for content marketers, which also offers exclusive access to an additional course that you can take to become a CopyBlogger Certified Content Marketer. Timothy Sykes took $12,000 of his Bar Mitzvah money and turned it into $2 million by trading penny stocks. This feat got him on Trader Monthly’s “Top 30 under 30” list and on a TV show called Wall Street Warriors. He then got hundreds of emails per day from people asking questions, which led him to write his book An American Hedge Fund. He initially launched his blog to help promote his book. Around that time though, his hedge fund lost 30%, which lost him a lot of credibility. To get it back, he decided to start from scratch and repeat his earlier feat of turning a few thousand into a few million, resolving to track each step of the way. Now he makes more money from teaching others how to trade than from trading himself. Timothy sells DVDs, offers coaching, and offers a subscription program called Tim Alerts, which lets his subscribers follow his trades in real time. 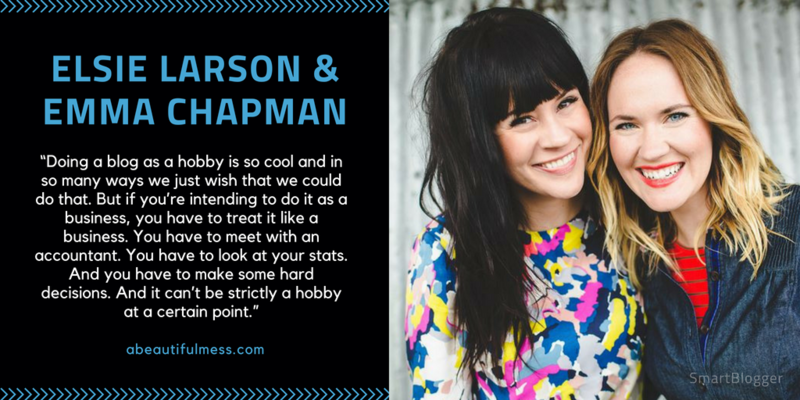 Elsie Larson and Emma Chapman are a sister team who have turned their food and DIY crafts blog into a raging success. Elsie started A Beautiful Mess in 2007 and Emma started a food blog a couple of years later. They then decided to combine forces, and that’s when things took off for them. At the time Elsie was running a retail shop, and she used the blog to move products, but the sisters soon realized that they enjoyed the blog more and that it was more profitable. They decided to close the shop and make the blog their main focus. They once got business advice from a friend who said they should diversify their income, and boy, have they taken it to heart. They have built up several healthy and reliable income streams over the years and they try to add a new one every year. They sell banner ads through AdThrive, promote products through affiliate marketing, and offer sponsored content. On top of that, they’ve written three books, created several courses, and launched three bestselling photo-editing apps. 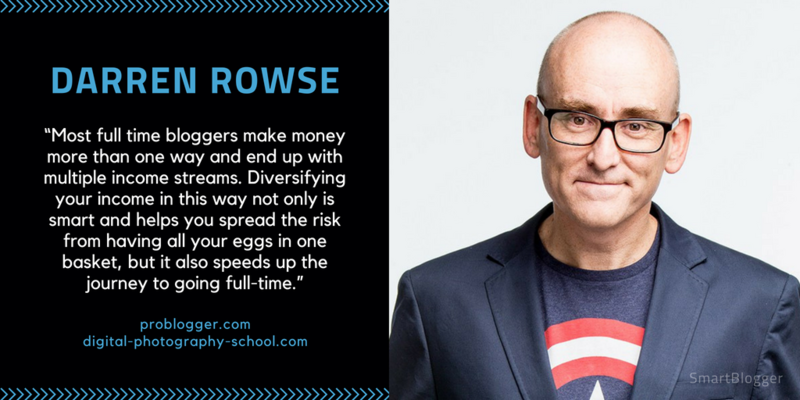 When Darren Rowse started blogging, he was only looking for a new hobby. He blogged about living in Australia, religion, politics, and other topics he found interesting. He didn’t even know you could make money blogging at the time. 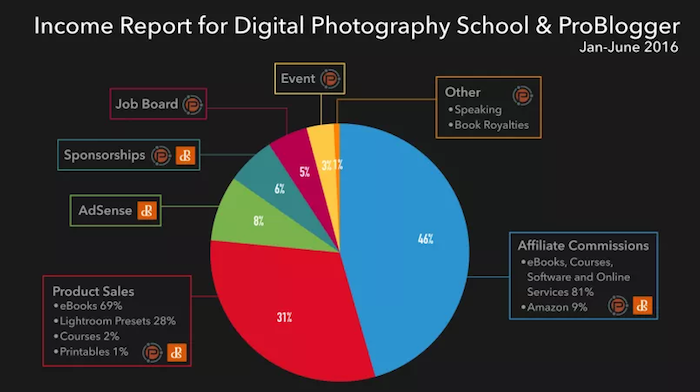 A year later, he started another blog on digital photography and discovered he could make money through ads and affiliate marketing. He only made a few dollars per week at first, but it was enough for him to see the potential. After consulting his fianceé, he decided to treat blogging as a part-time job and devote two days per week to it. He saw his income grow from a part-time into a full-time income, and eventually into an income most only dream about. Darren has started and been involved with numerous blogs over the years, but learned after a few years that his blogs perform better when he focuses on a few. So today he only focuses on ProBlogger and Digital Photography School. 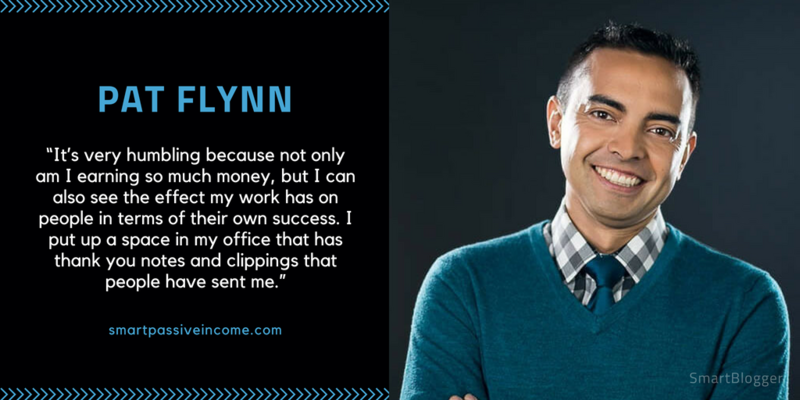 While affiliate marketing is still his biggest income source today, Darren has since been experimenting with different income streams over the years. His second-biggest income source is product sales. Between his two blogs, he sells dozens of e-books and several courses. On Digital Photography School, he also sells Lightroom presets. On ProBlogger he makes additional money through a job board, and also through hosting an annual event in Australia. After two of her daughters were born, Heather Delaney Reese looked for ways she could use the journalism skills she acquired in college and still remain a full-time stay-at-home mom. You guessed it. She started a blog. 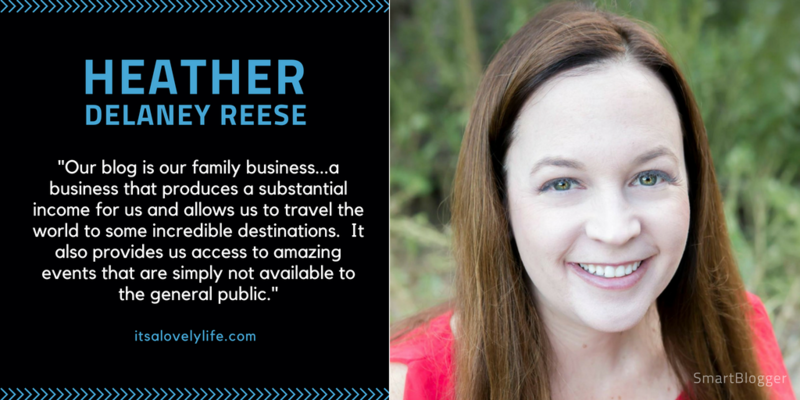 At first she wrote about budgeting and saving money, but over time she transitioned to writing about her family’s lifestyle and travel. Her husband Pete eventually quit his job to also work on the blog, and their three daughters now contribute as well. Over time, she has turned what started as a hobby into a full-time career for their entire family. Until March 2017, the Reese’s blogging income came solely from sponsored content. Every year their income increased as their audience grew and they were able to increase their rates. From March 2017, they also started promoting products and services through affiliate marketing. 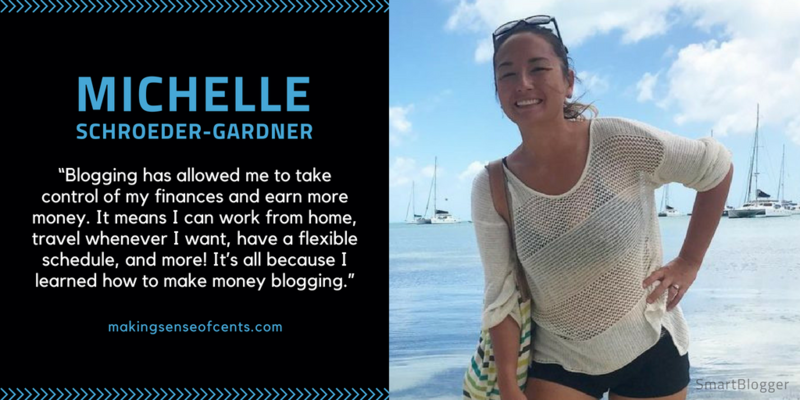 But their income truly boomed over the past seven months when they launched their premium courses, Blogging Blastoff and the Travel Blogging Fast Track, which they launched only months apart. 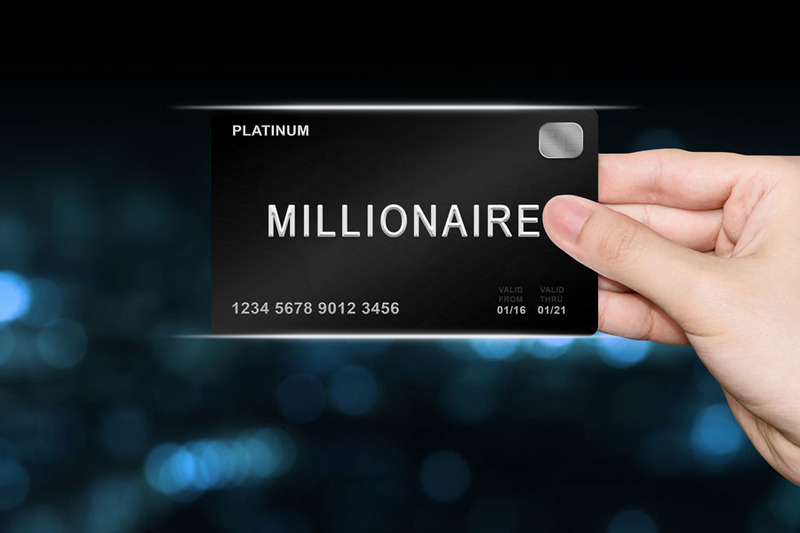 The launch of these two courses doubled their income and propelled them into their first seven-figure year. If you ever have doubts whether you’re chasing a pipe dream with your blog, keep these stories in mind. They all took different paths to success. Not everyone struck gold with their first blog, and you may not either. Not everyone got rich on their first attempt, and you may not either. That’s okay. Every step is a learning moment. If you keep going and keep trying new things, you’ll reach your goals eventually. It may be faster than you think, or it might take longer than you hope. But. You. Will. Get. There. Keep that in mind the next time you’re plagued with doubts. About the Author: Robert van Tongeren is the Associate Editor of Smart Blogger, who helps our writers get their posts in tip-top shape. He also runs his own blog that helps guys dress a little sharper at Restart Your Style. You can find him on Twitter here. The post This Is How 10 Bloggers in Different Niches Make $1 Million+ per Year appeared first on Smart Blogger.